CRYSTAL CITY, Va., Oct. 15, 2010 -- More than 200 Washington, D.C.-area high school students and teachers learned about the exciting career opportunities in the field of cybersecurity today during the Northrop Grumman Corporation (NYSE:NOC) Cybersecurity Education Workshop. 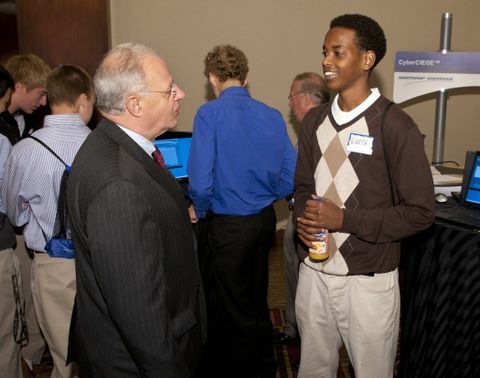 Held at the Hyatt Regency Crystal City, Northrop Grumman teamed with industry, academia, and government to inspire the next generation and help address the critical demand for cyber professionals. "The need for cyber professionals has never been greater," said Tim McKnight, vice president and chief information security officer for Northrop Grumman Information Systems. "The increasing number and complexity of threats in our cyber-enabled world is alarming. Investing in network protection really starts with investing in people who can deploy and maintain the ever-evolving technology and understand what it can and can't do. Reaching out to this population is critical to arming our future networks and preparing them for a safe cyber future." Howard Schmidt, White House Special Assistant and Cybersecurity Coordinator, served as the keynote speaker to tomorrow's cyber defenders. "During October, we all have a shared obligation to reaffirm our own commitment to increasing cybersecurity whenever and wherever possible," said Schmidt. "National Cyber Security Awareness Month provides a platform for those of us in government, at the federal, state, local levels, as well as our partners in the private sector, non-profit, academia, and internationally to help further educate all Americans and the global internet community about the importance of cybersecurity. It is our shared responsibility to create a safe, secure and resilient cyber environment." The half-day workshop kicked-off with a Hollywood-style dramatization of the chaos that can ensue from a cyber attack on our nation's critical infrastructure and financial systems, helping to illuminate for students the seriousness of the threats and the critical role cyber defenders play in our national security. 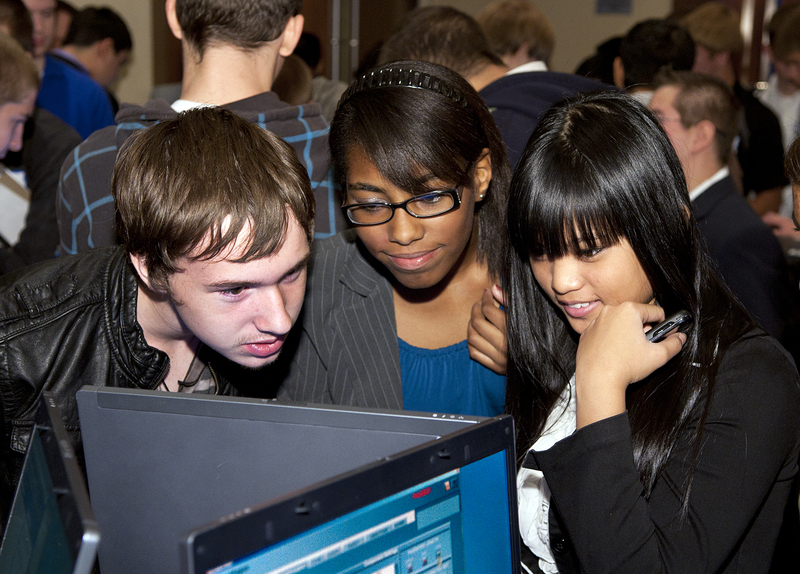 High school juniors and seniors from the Washington Metropolitan area participated in several interactive technology demonstrations learning about how threats are detected and mitigated and how malware is analyzed to stop the spread of a virus. Making the experience real, Northrop Grumman featured a new interactive cyber defense game, built upon the CyberCIEGE™ platform, developed by Rivermind, LLC. In the game, students tested their network defense skills where their actions directly affected how well their company operated and critical assets were protected. "It's their job to create a robust network, stop the hackers in their tracks and keep their company running smoothly," said Diane Miller, Northrop Grumman program director for CyberPatriot III and emcee for the event. Representatives from the Air Force Association's CyberPatriot III program, the premier national high school cyber defense competition, spoke with students about how they could get involved and enter a team. Northrop Grumman is the presenting sponsor of CyberPatriot III. Many of the students participating in the Education Symposium are members of teams competing in CyberPatriot III. Eight universities that specialize in cybersecurity curriculum were present to discuss their programs and give students an edge when planning their career track. They included Capitol College, George Mason University, Howard University, James Madison University, Penn State University, University of Maryland College Park, Utica College, and Virginia Polytechnic Institute and State University (Virginia Tech). Rounding out the day's events were several break-out sessions where students heard from workforce representatives, hiring representatives, university professors and others about how they can prepare now for a rewarding career in cybersecurity. Today's event was one of several initiatives launched by the company in October to mark the 7 th Annual National Cybersecurity Awareness Month. Northrop Grumman is an industry leader in all aspects of computer network operations and cyber security, offering customers innovative solutions to help secure the nation's cyber future. For more information about Northrop Grumman's cybersecurity capabilities and activities during the month of October, go to: http://www.northropgrumman.com/cybersecurity .